Austin’s oldest and most ornate theater, the Paramount hosts red carpet movie premieres, plays, ballets, concerts and comedy acts. The theater opened in 1915, featuring vaudeville performers and famous touring acts such as the Marx Brothers. It fell into disrepair by the early 1970s, but a major restoration was completed in 1979. From the deep red walls and carpet to the petal-like light fixtures in the lobby, everything about the decor oozes early 20th century Art Nouveau. The mezzanine seating area offers an excellent view of all the fine detail work along the railing of the balconies and bordering the stage. The ceiling is a work of art in and of itself. During one of the theater’s tougher periods, an amazing historical treasure was discovered. The original fire curtain was found hanging in the rafters in 1975. The curtains were so named because they were originally made of asbestos and were actually intended to prevent fires from spreading. Small fires were common in the early days of theater due to the use of candles, primitive lighting and often-faulty electrical systems. If a fire started on stage, the fire curtain would fall to shield the audience from flames. The curtain is still in use today, and it may be the oldest surviving original curtain in the country. The pastoral scene on the curtain was designed by Tobin of St. Louis, according to the Texas State Historical Association. With over 3,000 seats, the theater is large, yet it still has an intimate feel. Though some seats are listed as partially obstructed on the seating chart, the obstructions are minor. There’s really not a bad seat in the house. Opera box seats, balcony and upper balcony seats are pricey but well worth it for a special occasion. A center row in the mezzanine area may be the best combination of value and sight line. With its Moontower Comedy Festival, the Paramount has played a key role in making Austin an increasingly high-profile player in the national comedy scene. Recent festivals have included big-name comedians like Maria Bamford, Dana Carvey, and Jim Gaffigan. In 1982, the theater hosted one of its first world premieres, for the film version of The Best Little Whorehouse in Texas. Since then, the Paramount has become the go-to spot for high-profile movie premieres in Austin. Director Robert Rodriguez frequently hosts premieres at the theater, bringing many of his celebrity friends to town for the events. There’s a small bar in the lobby that easily gets overwhelmed during intermission. Drinks are overpriced anyway. You may want to do your drinking before or after the show; there are plenty of bars within walking distance. While you will still find the stray dot-com millionaire in a t-shirt and jeans, people normally dress up when they go to the Paramount, particularly for plays and ballets. Amid such glorious decor, it somehow seems wrong to be less dressy than the building itself. Convenient parking is available at 163 W. 7th Street in the One American Center parking garage for $10. 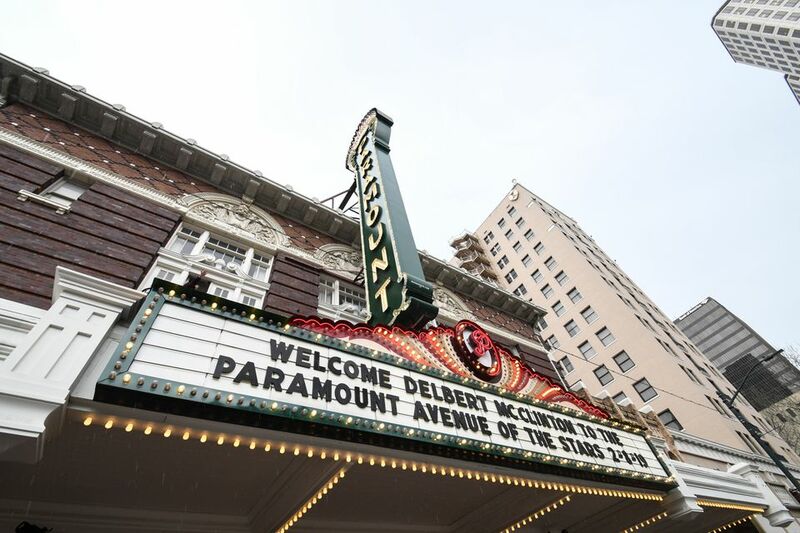 In 2000, the Paramount Theatre joined forces with the nearby Stateside Theatre to form the Austin Theatre Alliance. A historic Art Deco theater, the 320-seat Statesidehosts plays, film festivals, awards shows, and intimate music and comedy performances.